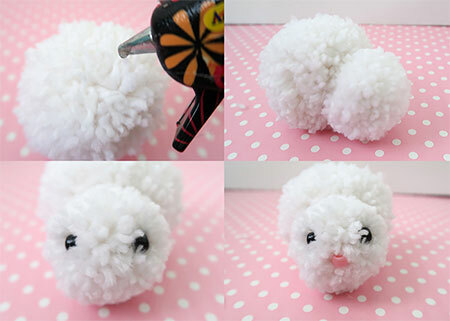 Here's a fun craft that the kids can do over the holidays - these pom pom Easter Bunnies are cute and simple to make. 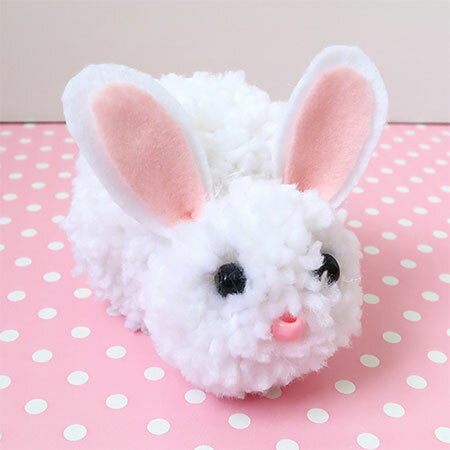 Cute and cuddly, this pom pom Easter Bunny is a great kids craft for your youngsters to make over the holidays. All you need is some white wool and a few accessories and tools. 1. Cut two lengths of wool to 150mm length and put these aside. 2. Wrap some wool around two fingers, wrapping about 80 times around your fingers. Don't wrap too tightly but don't let it be loose. 3. Slide the wool off your fingers and lay it on top of one of the two pieces we cut earlier. 4. You want the 150mm length of wool to be as shown in the last photo below. 5. Take the single strand of wool and tie the piece around the wrapped wool, very tightly. It should be as tight as possible and then do a knot. 6. 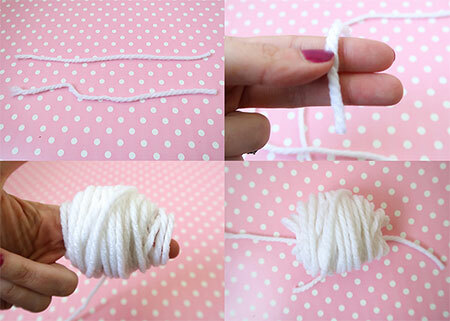 Use scissors and cut all the loops created after tying the wrapped wool. 7. 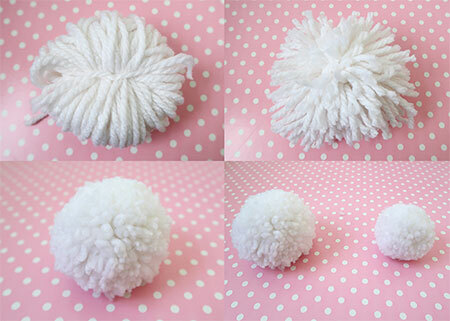 You should have a funny shaped pom pom. 8. Carefully trim to shape and you will end up with a round ball. 9. 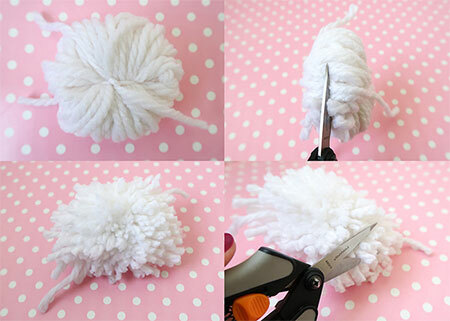 Keep trimming until you have round pom pom. 10. Repeat steps 1. to 9. but use four of your fingers to wrap the wool around. 11. Repeat to tie and trim as you did with the first pom pom and you will end up with two pom poms - one bigger than the other. 12. 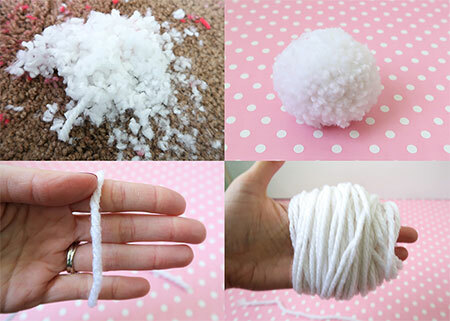 Let the glue gun heat up and then glue the smaller pom pom to the big one. 13. Now you can glue on the eyes and nose. Make sure to use your fingers to separate the wool to glue the eyes and nose as deeply as possible into the wool. 14. 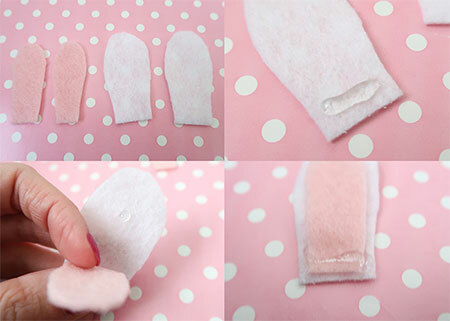 Take your felt and cut two large ear shapes out of white felt, and two smaller ones out of pink felt. 15. 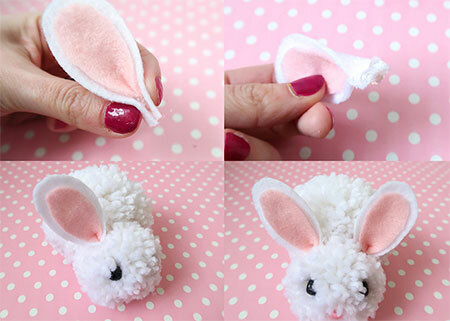 Use small blobs of glue at the top and bottom to layer the pink inner ear on top of the white outer ears. Place a strip of glue along the bottom of the whole ear. 16. Quickly pinch the sides together make the ear shape. 17. Use your fingers to separate the wool to apply glue to each ear and insert it into the space between the bunny’s head and body. Repeat for the other ear and you're done!